This summer we went back to Cornwall for a third year, and decided we’d stay at Coombe Mill. We join in with Country Kids as much as we can, and enjoy the outdoors. Just follow Coombe Mill’s Instagram and you’ll see the beautiful scenery and fun on the farm. Coombe Mill is in St Breward, near Bodmin. It’s a working farm, something I had a lot of questions about, because I’m a curious person who likes to know stuff. I’ve often wondered if owning a farm and rearing your own animals means you could eat them. We soon found out that the animals without names were the ones which went! H was doing her Brownie ‘Friend to Animals’ badge there and learned a lot of facts which helped too. We stayed in Trebah, a Scandinavian style lodge which was cosy and comfortable and had everything we needed. You have a washing machine and a dryer which came in handy as we had a lot of rain. We also had a wood burning stove which kept us really toasty on the more chilly nights. Two doors down was The Boy and Me gang so H had a playmate, and over by the train tracks was Jo from Mummy Needs Wine. It was a proper blogger get-together! So what does Coombe Mill offer? For H, freedom. We live in London and I get twitchy enough her going to post things at neighbours houses. We joined the feed run every morning, and H got to drive the tractor with Farmer Nick twice which she really enjoyed. She learned facts about the animals, picked them up and by the end of the week was way more confident with them than at the start. Bear in mind as we rent we can’t have pets, and she has never spent a chunk of time around animals this was a big deal for her. By the end of the week she was picking up hens and rabbits without a care. At the start of the week there were a few strops when they didn’t just magically come to her! Coombe Mill is a great place to stay. It’s somewhere you could stay through the day and still have plenty to do. Aside from the feed run there’s the daily train ride from Coombe Halt which H insisted we HAD to go to. H even got a circuit on her own! We loved watching the wild deer every morning on the feed run. I loved opening the doors and listening to it all. The river, the birds, the animals. I started to breathe again, to relax. But then all of a sudden our week was over – it flew by! I wish you could bottle it up so I could have some to remind me of the calm. The thing I loved the most was meeting parents every morning on the feed run and chatting. Everyone was so friendly – and H made new friends. She’s sending a Christmas card to a girl she met at Coombe Mill as they swapped addresses and write to each other. Our last night we had an outdoor barbecue with the bloggers, and it was a lovely end to a lovely week. The kids all played around us, their age differences didn’t matter as they all got stuck in and enjoyed each other’s company. You can’t beat that as far as holidays go. The Coombe Mill website is here. Obviously we’re linking in to Country Kids again! At half term we headed north, staying just outside of Alnwick. As Historic Houses Association members we get free entry to several properties across the UK over set periods during the year. Alnwick Castle was open, and was our destination! Alnwick Castle is difficult to miss. It dates back to the early 1000’s, and has been (one of the many) residence of the Duke of Northumberland for many years too. When the Duke is away, us mere muggles can visit. I didn’t tell H about the Harry Potter connection until the morning we went – I wasn’t sure how big a deal it would be. She’s a bit obsessed so I wanted to make sure I was careful. So instead we watched the first two Harry Potter films before leaving London – as all outdoor scenes were filmed at Alnwick Castle. It meant when we got there we could say “ooh, remember this bit?” “this is where Harry learned to fly” and thanks to a mistake on my part have to walk all the way over to the ticket office which is inside the castle to get our HHA tickets. Fortunately this was next to the area you get a ticket for a timeslot to do broomstick training. We wandered around the grounds and learned about the history of Harry Hotspur, a gentleman whose name inspired our football team of choice. Add to that there was a Halloween Trail and actually, there was loads to do. Falconry displays were on all day, and you could pay an additional amount to do some archery. H also helped the Alnwick Castle Alchemist make some Dragon’s Blood. However, the thing we enjoyed the most had to be Broomstick Training. Get over to the area to book a slot – at 10.30 we got a 2pm one. For the Potter-mad fan it’s fun. H saw it initially and declared it was “too babyish” for her which is utter nonsense. By the time she was doing it her face was like this – pure joy! The broomstick training session lasts 20 minutes, then you get 10 minutes to take some great flying pictures. Let’s just say, people I thought would get it don’t at all (which is quite amusing). It’s cleverly done and tons of fun. Alnwick Castle is a great day out – plenty of walking to be done and things to learn and discover. If you have the time (and energy) then a trip to Barter Books up the road is worth your time too – even just to sit down and take in the amount of books there! The website is here. Alnwick Castle is currently closed until next year. South London into Surrey can feel like an area where it’s difficult to breathe. We’re so lucky having open space nearby. As it’s a gloriously sunny day we headed to the Banstead Woods Narnia Trail. Banstead Woods Narnia Trail has been in the woods for a couple of months now. For now it’s a pleasant enough walk without any tricky bits. I’d even stick my neck out and say it’s buggy-friendly too. As long as you’re happy dealing with mud. Banstead Woods has many different routes around it, but you can’t miss Lucy Pevensie and the lamp post if you enter the woods from the Holly Lane car park. Keep walking and you’ll get there. You’ll also spot some cute wooden carved signs which point out things that could be spotted around the woods, and are apparently good for nature rubbing (we’ll do that next time). After getting to the Lucy Lamppost, walk down the track to the side of the woods, out in the fields. In August the main thing to do here is foraging. We headed through the gate at the end of this field, through the bluebell woods (the bluebells long-gone). We walked up to the area I call the ‘train track’. In my head, it probably has never ever been a train track, it’s just very straight, defined and disused train track-like. We walked along there back to the big slope which leads back to the car park. Turning right there we headed to the top of the hill and made our way as far as the little pond. Once there, we turned back towards the bluebell woods, or at least in a direction that felt like it was. Eventually we made it back to the train track, when lo and behold! There was the wardrobe complete with wooden clothes inside. You can walk through it and it’s fabulous! H was being pretty grumpy around now as she moans if she walks too much. Having said that, we found plenty of sticks which double up as Harry Potter wands so she just expelliarmus’d us a few times. After walking through the bluebell woods we hit a single track, a bit more foraging and a giant great big Aslan at the end! By then we were near the car park again on the big slope. So that’s the long way to do it. The short(er) way would be to walk up the slope a fraction and turn at Aslan. Walk through the bluebell woods and follow the track which goes diagonally across them, then train track and down. The Banstead Woods Narnia Trail is fun. I’m hoping we’ll get more of these wooden sculptures, after all, the woods need a Mr Tumnus. Last weekend we had a few days off work and holiday club, so headed away for a few days. We had a short Essex family break – getting away from it all. A short Essex family break isn’t the first thing you’d think of when planning a few days away. Initially we were looking around Europe for something within the £500 range, but soon gave up. Hands up, who has never been to Essex properly ever? Me. I don’t know why. There are lots of places in this country I have never visited properly, and Essex is one. It’s also one of the closest to where we live, M25 traffic permitting. To celebrate Shaun’s birthday (as his is two days before H’s), we headed to Mount Hall Woodpecker Yurt as a little getaway for the three of us. After our previous brilliant but noisy Yurt experience, I was hoping for something a little more quieter and we got it. Mount Hall is just outside Colchester, again another place I had never visited. I mean, without knowing anything, the name Colchester doesn’t sound like somewhere you would actively visit, right? But oh, so wrong. The history! H’s first topic in Year 4 is the romans, and as we couldn’t make it back to York, Colchester is as good a place for some proper Roman history. Colchester Castle is really interesting and worth visiting too. Fancy a half hour drive? 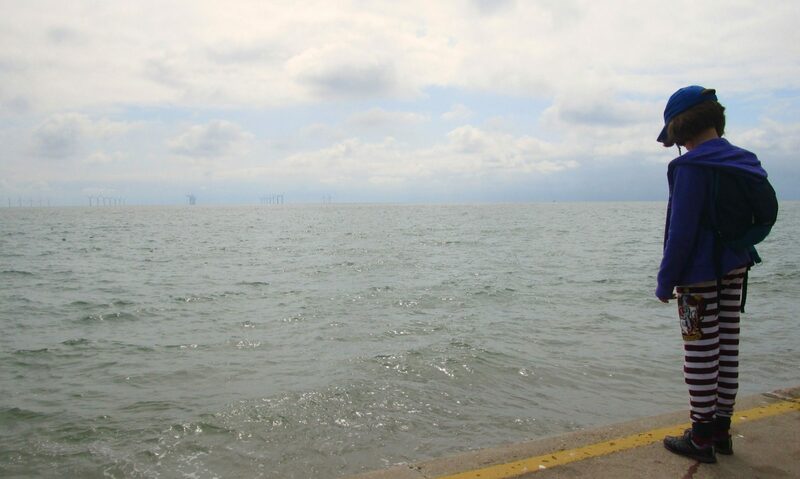 Then you have Clacton-on-Sea and Walton-on-the-Naze, both have piers you can walk along. The Walton Pier is massive, and a quite decent long walk out to sea whereas Clacton’s Pier is full of amusements. Both are good places to use up your spare 2p’s on the machines in the arcades. Out to sea is a windfarm which covers the skyline. I think we’ve seen it when coming in on flights as you line up with the Thames Estuary – you can’t miss it. Walton-on-the-Naze has an entire hill full of beach huts all beautifully coloured which you can see from the pier. The best part of our short Essex family break was the location. You’re not far from the A12, there are shops nearby for supplies but it’s still quiet. You are under the Stansted flight path which doesn’t make it completely quiet, but it’s still quieter than our previous stay. Woodpecker Yurt has its own shower and kitchen block, as well as games for the private garden area. We could also borrow cycles. H enjoyed having a go on an adult bike while I fear she’ll need another bike already as it only felt like yesterday that she got her last one… she grows too quickly. Around the Woodpecker yurt are apple and pear trees, with grapes growing on a side wall. We didn’t hear the woodpecker, but could still hear the chickens and horses just over the wall. H’s new found love of animals since she went to Coombe Mill meant she went to feed the horses some grass every day we were there. Every night we had a BBQ. It’s quick and easy, in fact, the most difficult thing was finding somewhere that had vegetarian food. The local Co-Op had run out so we had to drive to a Tesco in Colchester. The joys of arriving on a Sunday when the shops had closed. On the second night we toasted marshmallows at the fire pit. It was a lovely relaxing stay, and I feel like I want to discover more of Essex. I don’t know why we’ve never ventured out there. It’s so pretty! I found our yurt for our short Essex family break via Canopy and Stars. Of course, what this now means is we’re going to look into getting camping gear, and get into the camping lark properly while the weather is still good. This may be a bonkers idea, but right now it feels like a REALLY good idea! We’re linking up to Country Kids this week, it has been a while – it seems only fair as H and Shaun are in the Coombe Mill blog this week!